Open: In December, on Friday and Saturday from noon to 4 p.m., weather permitting. Please call for more information. Closed January and February, Easter Sunday, Thanksgiving and Christmas. Open March through November, Monday-Saturday 10 a.m to 4, Sunday noon to 4, weather permitting. Admission: $1 Students, $2 adults, and $25 for groups up to 25 people. Guided tours: an additional fee of $3 for adults and $1 for students. In December, tours are by reservation only. From March to November, guided tours are given from 11 to 3:30 p.m. An historian leads visitors to Colonial and Revolution-Era people and tells their stories. The brick wall of the Christ Church Burial Ground, built in the 1770s, has a gap through which Benjamin Franklin’s grave is visible. Franklin’s tombstone has a large slab, almost as big as a bed sheet, carved with the names Benjamin and Deborah Franklin and the year 1790, the year of his death. Franklin was buried near the wall because that is near the grave of his four-year-old son Francis, now remembered by a small brass plaque. The child died of smallpox. Franklin’s daughter Sally and her husband lay in the grave beside him. She raised money for the Continental Army and later sewed shirts for American soldiers. Even during his lifetime, Franklin had been Philadelphia’s most famous citizen. He was responsible for the paving, lighting, and patrolling of the streets, along with improving the postal service, which made Philadelphia the communications center for the entire country. Franklin founded the nation’s oldest subscription library in 1731. He was also instrumental in founding the Pennsylvania Hospital and the “oldest continually active mutual fire insurance company in the country.” In 1757, he traveled to London as an unofficial ambassador to the Crown. When he returned to Pennsylvania in 1775, he joined the Second Continental Congress, which included John Hancock, George Washington, Patrick Henry, and John and Samuel Addams. Afterward, Franklin sailed to France, where he helped to get diplomatic recognition of the United States. At the end of the Revolutionary War, he negotiated the treaty with Great Britain, then returned to the United States to attend the Constitutional Congress in 1787. He was one of only five men who signed both the Declaration and the Constitution. When he died in 1790, 20,000 Philadelphians followed the cortege to the Christ Church Burial Ground. In 1850s, bricks were removed from the wall to allow people to view Franklin’s grave. The custom of scattering coins on the grave began at that time, when a bride would toss a coin for luck onto the grave on her way to Christ Church to be married. Franklin’s marriage to Deborah had been long but not especially happy. Franklin married Deborah in 1730, when he was 24 and she 22. She died of a stroke 44 years later while he was in London. He’d been gone 16 years. While Franklin’s is the most visited grave in the cemetery, the graveyard holds the remains of five signers of the Declaration of Independence, including George Ross, who served three years in the Continental Congress; Francis Hopkinson, a composer who designed currency; and Joseph Hewes, a delegate to all five Provincial Congresses who signed the Declaration for North Carolina. In the Burial Ground rests John Dunlap, the Declaration’s first publisher. His descendents continue to be members of the Christ Church congregation. Also in the graveyard lies Colonel Edward Buncome, who died in nearby Germantown during the Revolutionary War and was buried here. A bronze plaque inside the cemetery’s wall remembers William Henry Drayton, signer of the Articles of Confederation and a member of the Continental Congress from South Carolina. His unmarked grave is now lost. The cemetery contains a “Who’s Who” of Pennsylvania naval officers, including Commodore James Biddle, who received the Congressional Gold Medal for capturing the HMS Penguin during the War of 1812. Before his career was over, he’d signed treaties with Turkey and China and landed in Japan. Although two of the commodores were moved to newer family plots in Philadelphia’s lovely Laurel Hill Cemetery, Commodores Thomas Truxton (one of the first six captains appointed after the United States formed its Navy) and William Bainbridge continue to lie here. Bainbridge’s obelisk was restored by officers and alumni of the U.S. Naval Training Center in Bainbridge, Maryland, named in his honor. 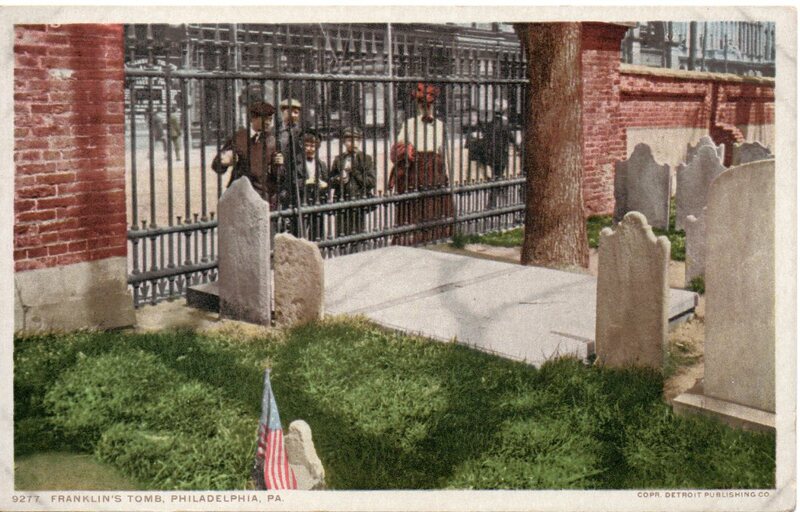 A number of Philadelphia mayors also lie in the Christ Church Burial Ground, including Matthew Clarkson, a Continental Congressman who was mayor during the Yellow Fever epidemic of 1793. This entry was posted in Cemetery of the Week, Famous person's grave and tagged Christ Church Burial Ground, Pennsylvania cemetery, Philadelphia cemetery, Revolutionary War graveyard. Bookmark the permalink.